Clouds are integrations or connections to public, private, hybrid clouds, or bare metal servers. Clouds can belong to many groups and contain many hosts. The clouds view includes clouds status, statistics, tenant assignment, and provides the option to add, edit, delete new clouds. Morpheus supports most Public Clouds and Private Clouds. Information on each cloud type can be found in the Integration Guides section. Clouds can be added from Infrastructure -> Clouds or in Infrastructure -> Groups -> (select Group) -> Clouds . Individual Guides for adding specific Cloud Types can be found in the Integration Guides section. 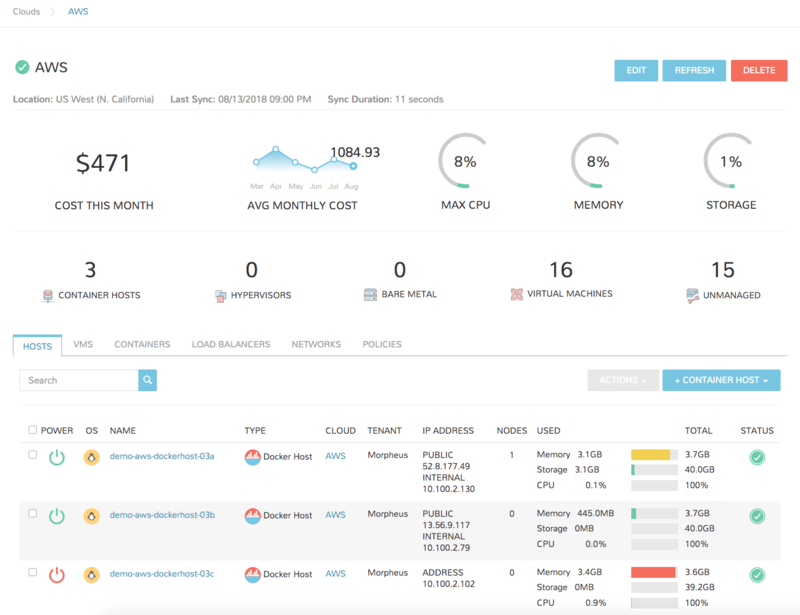 The Cloud Detail view shows metrics on health, sync status, current month costs, average monthly costs, resource utilization statistics, and resource counts for Container Hosts, Hypervisors, Bare Metal, Virtual Machines, and Unmanaged resources. To view the Cloud List View, select the name of a Cloud to display the clouds Detail View. Edit the setup configuration of the Cloud. Force a sync with the Cloud. Last sync date, time and duration is shown under the Cloud name. All Instances and managed Hosts and VM’s associated with the Cloud must be removed prior to deleting a cloud. Not all tabs are available for all Cloud Types. The hosts tab panel displays available hosts in the cloud and displays power, os, name, type, cloud, ip address, nodes, disc space, memory, and status. You can add a container host from this by clicking the Container Hosts button, add a hypervisor host by clicking the HyperVisor button, or perform actions actions by click the Actions button. Displays an Inventory of Existing Instances in your cloud configuration and provides details such as power, os, name, type, cloud, ip address, nodes, disc space, memory, and status. Setup PXE Boot in the Boot section to add bare metal servers. Once setup you can view information such as power, os, name, type, cloud, ip address, nodes, disc space, memory, and status. The Security Groups tab panel displays a list of existing Security groups in the cloud. You can add a security group to this cloud by clicking the Edit Security Groups button. The load balancers tab panel displays available load balancers in the cloud and displays the name, description, type, cloud and host. You can add a load balancer from this tab by clicking the Add Load Balancer button. Displays Networks synced or added to the Cloud. Displays Datastores synced or added to the Cloud. Displays Resource Pools synced from the Cloud. Manages Policies enforced on the Cloud. Provisions a Docker host into the Cloud, or adds an existing Docker Host (manual) to the Cloud. KVM hosts are also available for Morpheus and Bare Metal cloud types. Add an existing Hypervisor to the Cloud. Not available for all Cloud types. Select the Clouds link in the sub navigation bar. Click the Delete icon of the cloud to delete. All Instances and managed Hosts and VM’s must be removed prior to deleting a cloud. To remove Instances, Hosts and VM’s from Morpheus without deleting them in the actual Cloud, select Delete on the Host or VM, unselect “Remove Infrastructure” and select “Remove Associated Instances” if Instance are associated with the Hosts or VMs.